Ayurveda is the science of life. In recent years alternative medicines have got popularity as the conventional western medicines fail to address all the diseases. The allopathic system of medicine is not effective in certain diseases like Rheumatoid Arthritis, Chronic gastric problems, fistula etc. And also the cases of bacterias showing resistant to most of the antibiotics have increased. The slow rate of new antibiotics development has opened a door for lifestyle medicine to increase the immunity of self. If we talk of alternative medicines we will find that there is significant proof of alternative medicine showing a positive impact on the lives of Asian counterpart for centuries. The Traditional Chinese Medicine or popularly known as TCM has an impact on the lives of Chinese people. More than half of the Chinese people rely on it. Similarly, In India, Ayurveda has a great impact on the Rural Indian People. Ayurveda comes under Indian System of Medicine(ISM) which includes Ayurveda, Unani, Siddha, Sowa-Rig-Pa, Yoga. Now Indian government has set up a separate ministry for the uplifting of the Indian Traditional Medicine Treasure which is AYUSH. Under AYUSH, Homeopathy has been included to strengthen the alternative medicine system along with conventional Western Medicine. Ayurveda which said to be originated from Lord Brahma has a history of thousands of years. The knowledge which was then transferred to many sages before it reached to human. As I already said the Ayurveda has a long history as it is science based on then. Ayurveda has its own concept of the body has its functions. If you would like to dig more about Ayurveda as its concept I will recommend the following books. These books are written by pundits of Ayurveda who has done years of study on the subject matter and spent years as Ayurvedic Practioner. Textbook of Ayurveda is written by famous Ayurveda guru Dr. Vasant Lad. Dr. Lad is a certified Ayurveda practitioner he has been teaching Ayurveda to students in New Mexico for more than 20 years. He also travels a lot to spread his knowledge of Ayurveda in different countries. Textbook of Ayurveda has three volumes diving the vast information so that students can grab the knowledge without any difficulty. Textbook of Ayurveda: Fundamental Principles of Ayurveda is best for a beginner to get exposed to the knowledge of Ayurveda. This book is written in such a way that every student can understand the concepts in Ayurveda. Dr. Lad being a teacher he knows how to structure the book simple at the same time resourceful. He has also used illustrations and diagrams to explain though subject topics. This book has a good rating from readers and highly recommended for a beginner to experience Ayurveda. The Sebastian Pole wrote this book with an intent to simplify the practice of Ayurvedic medicines and herbs. He has covered more than 80 Ayurvedic medicinal herbs with ayurvedic pharmacology, materia medica, formulations and adverse effects. This book has finally filled the space between Dravyaguna and Yoga of Herbs. It is totally comprehensive with color pictures, superb detail of each herb, and very well organized. I would like to clarify that this book is not for someone who just wants to get a superficial knowledge of Ayurveda and the practical aspects of Ayurvedic herbs. The words used and way of writing is so soft that anyone can understand what he wants to say. Though the book is not for someone completely new to Ayurveda, for someone intended to start practicing Ayurvedic medicines. Ayurvedic Medicine: The Principles of Traditional Practice has a lot to offer on simplified Ayurveda Pharmacology. This book is also written by Dr. Vasant Lad. The first edition of this book came out in 1984. Though this book is old enough this book has all you need to know about Ayurveda. The book covers history & philosophy of Ayurveda, basic principles of Ayurveda, diagnostic techniques, treatment, diet, medicinal usage of kitchen herbs & spices as per Ayurveda, first aid, food antidotes and much more. More than 50 concise charts, diagrams and tables are included, as well as a glossary and index in order to further clarify the text. He wrote this book with the intent to introduce Ayurveda to the western world. He got a BAMS degree in India and moved to the USA to start his own Ayurveda School. He was asked to write a book on Ayurveda so that anyone can understand and get benefited from it. Ayurveda: The Science of Self Healing: A Practical Guide is one of the best books on Ayurveda. This book has high rating from readers and loved by many students across the world. Written by Ayurveda enthusiastic and Yogi Sahara Rose Ketabi. She has a wide knowledge on Nutrition and Ayurveda diet. Her book Ayurveda (Idiot’s Guides) is approved by Holistic Guru Deepak Chopra. This book is strongly recommended for beginners who want to know about Ayurveda. After reading this book you will be able to discover your unique Dosha and how it shows up in your physiology, metabolism, digestion, personality and even dreams. You will also learn how your body’s needs change according to the season, environment and time of day, Ways to regain luster, passion and flow in your life. She has included some Easy-to-make, plant-based recipes relating to each element for readers. Using Ayurvedic herbs and spices to heal digestive issues, skin problems, hormonal imbalance and other ailments. Sahara is a well-known Nutritionist and Ayurvedic Practitioner helping people to live a better life. Her podcast “Highest Self Podcast” has more than a million downloads on iTunes. Ayurveda healing a book by David Frawley who is a scholar in Ayurveda. He has received “Padma Bhushan” which is the highest civilian award in India for his works on ancient Indian medicines. His book Ayurveda healing includes 80 different diseases from common cold to cancer and their ayurvedic treatment. This is must if you want to know the potentiality of Ayurvedic medicines and uses. This is a well-organized resource book for anyone wishing to gain a sound understanding of Ayurveda. It delves into the underpinnings of the science of Ayurveda, describes the gunas, doshas, kosthas and the common methods of treatment for various ailments. In particular, I like the specific, practical recommendations Frawley offers for Western readers who may need to find substitute ingredients for some of the herbs found in the traditional Ayurvedic tonics. The first edition of the book was released in 1989 still this book is one of the top books written on Ayurveda. This book is written by Susan Weis-Bohlen who is a full-time Ayurvedic consultant, cooking teacher, meditation teacher, and leader of sacred site tours. 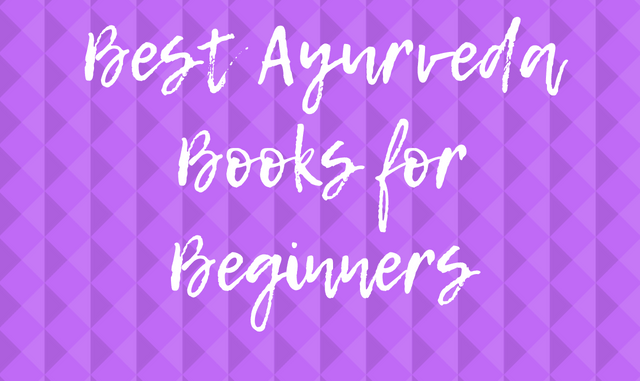 As the name of the book says “Ayurveda Beginners Guide” which is true in the sense that this book is for someone who wants to discover Ayurveda and apply its methods practically in life. This book is approved by the guru of Ayurveda in the West Dr. Vasant Lad himself. He considers this book is simplified and written straightforwardly so that every person can understand. The book includes a concise overview of Ayurveda, A 3-week Ayurveda plan for beginners, A wide range of Ayurveda techniques, A simple dosha quiz and in-depth descriptions of each dosha. The book is colorful and organized well. But, someone searching for in-depth resources on Ayurveda may get disappointed. Overall Susan has been able to put her expertise on Ayurveda through this book. This book is perfect of someone who is new to Ayurveda and want to adapt Ayurveda practices in his or her life. The book is written by Angela Hope-Murray, MSc (Ayur) MA, who has been a practitioner of complementary medicine for over 30 years. The language of the book is simple so that anyone can understand. After reading Ayurveda for dummies one should able to find his/her body type and plan diet according to body type and seasons. Murray advises you on ways to optimize your health by exercising to suit your body type, She gives you trusted info on stretching your body with Yoga. The book has some Yoga poses with descriptions and pictures which can come handy for someone looking for body stretching tips. The beautiful tables included in the book makes the book more simplistic for someone who finds figures/data hard to devour. Glossary of Sanskrit words at the end and side by side English and Latin translations is appreciable. Murray takes literally that she is writing for dummies. Overall, the book is a gem for Ayurveda beginner but I have to say this book is not for someone who is seeking some advanced pieces of information. This book has a lot to offer. The small size of the book may be disappointing for someone. Overall, Anne McIntyre who is a Fellow of the National Institute of Medical Herbalists has abled to stand on providing a concise subject matter on Ayurvedic healing. The writer has described beautifully all the principles of Ayurveda. She has included different herbs, their uses, and formulations which is appreciable. She talks on keeping ourselves healthy through diet, lifestyle, and exercise. The book covers the three prime qualities of Ayurveda and how to assess a person’s Ayurvedic constitution — doshas and dhatus. It describes the relationship between food and a person’s constitution and the role of preventative health in Ayurveda. Written by a graduate of the Ayurvedic Institute in Albuquerque, New Mexico, Judith Morrison. She has a good knowledge of Ayurveda and its practical aspects which can be seen in her book. This book is filled with colorful diagrams, pictures, tables which makes the book easy to read for beginners. But a good overview. Not preachy or pushy. I can almost hear the author speaking in a soft affirming voice as I read. Makes me feel like I could get a handle on this self-awareness technique and apply it for better well being daily. The author encourages small changes so no pressure. The way this book is laid out makes it so easy to reference. It is not a book for the student who has lots of knowledge/experience. For the lay-person, it is a must. This book is written by Acharya Shunya who is an internationally recognized spiritual teacher who awakens health and consciousness through Ayurveda lifestyle and Vedic spiritual teachings. While the book is rich with recipes, remedies and wise counsel on how to be healthy and happy, what I found outstanding and absolutely unique is how the context for each section is created through evocative and deeply informative stories from the author’s young days studying with her grandfather, who was a learned yogi and insightful traditional healer. These stories are vivid, endearing, and deeply spiritual, and invite the reader to contemplate and experience the many dimensions of the state of health that the author and Ayurveda focus on. After reading this book you will have knowledge of the basic principles of Ayurveda, body types and diets according to seasons. She has also included Dozens of traditional recipes, along with advice for structuring your meals according to the season, your constitution, and your unique health needs. She teaches wellness practices like meditation and pranayama, exercise and yoga, connecting with nature, rituals for self-care and pleasure, daily cleansing routines, and working with the doshas. Ayurveda Lifestyle Wisdom is an excellent book to know how to maintain beauty routines and rituals, including recipes for homemade scrubs, oil blends, gargles, and more. She has also stressed on how to achieve more joy, better sleep, increased sexual pleasure, improved digestion, stronger immunity, and many other benefits in mind, body, and soul and bringing changes in modern lifestyles. A beginner book should have all the ingredients like simple language, soft words, diagrams, pictures, tables son that it become informative as well as easy to read. All these ten book listed has the ingredients of a beginner’s book. Some of them are written by well known Ayurveda pioneers while some are written by modern Ayurveda healers but all have the same overwhelming writing techniques.